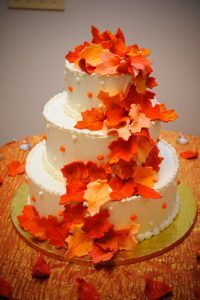 Why Choose To Marry In Autumn? As Summer disappears from our memory, it’s time to embrace the change of season with its brisk mornings and gorgeous autumnal colours. 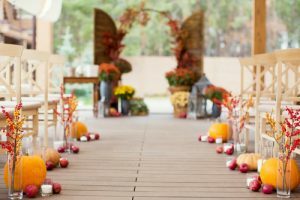 There are lots of reasons to opt for a fabulous Autumn wedding and to help convince you, we’ve chosen a few of our favourites to share with you in this week’s blog. So, time to read on to discover Woodhall Manor’s top reasons to book an Autumn wedding. Be inspired by mother nature’s fantastic natural palette that so perfectly represents this special time of year. Colours synonymous with autumn include burnt orange, deep red, bold yellow and deep chocolate. This palette is rich and deep in tone, blending perfectly when used together. 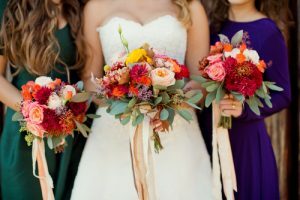 Add these fabulous colours to your decor, floral arrangements and bouquets and even your outfits to give your wedding a distinctly autumnal feel. In addition to the glorious autumnal colour palette, there is also plenty of inspiration to be taken from the great outdoors. What’s even better is that many of these can be gathered from woodlands, parks and hedgerows making a cost-effective option for your wedding decorations. We love arrangements that include conkers, pine cones and leaves to bring the outdoors into your theme. At harvest time there’s an abundance of fruit which can make another great seasonal addition to your theme. Why not add apples, pears or damsons to your arrangements, or for large displays, use pumpkins, squashes and gourds to add wonderful colour and create a dramatic presence. You could really go to town with carved pumpkins and tea lights as DIY lanterns to light your path. 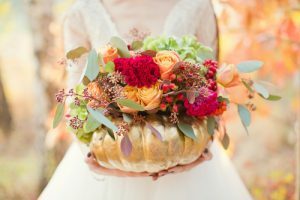 Creative florists could use hollowed pumpkins as makeshift vases to fill with seasonal blooms. Many popular bridal choices are in season during Autumn such as roses, hydrangeas and anemones so you shouldn’t have any trouble sourcing your favourites. For us, Autumn wedding flowers should be all about an injection of colour. Look to the rustic colours of the season with orange, purple, red, plum and burgundy as your palette. For texture add in seed heads, berries and seasonal foliage to add extra interest and shape. We love calla lilies which are in plentiful supply in September and available in a wealth of colours including a stunning burnt orange which would be ideal for an Autumn wedding. If you opt for a typically autumnal theme such as a rustic woodland, you’ve plenty of help available from mother nature. Gather twigs, leaves, cones and seed heads to help weave your entire theme around the season. Create rustic looking invitations, menus and name cards from kraft paper and add leaf and wreath motifs as well as natural twine for a down to earth feel. Wood tree sections make ideal plinths for candles, lanterns, table centrepieces or even your wedding cake! Miniature versions can be used as the base for place settings, menus and table numbers. When it comes to the wedding cake, why not opt for a design that incorporates leaf and vine designs, or maybe an on-trend naked wedding cake that’s liberally decorated with seasonal berries. We’d like to think we’ve got you seriously thinking about holding an Autumn wedding and there’s plenty more to come. Next week we’ll be sharing our thoughts on what you and your wedding party should wear at your amazing Autumn wedding ceremony. Our stunning Manor House looks gorgeous throughout the year but if you’re drawn to the fabulous qualities of Autumn, then talk to our talented wedding planners today to find out how we can create your perfect Autumn wedding.  We’d love to arrange a private tour of Woodhall Manor so call 01394 411288 or email info@woodhallmanor.com to arrange an appointment.